Emily Cook finished 19th at the 2010 Games and 11th in 2006. 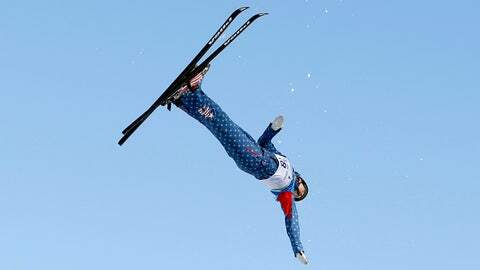 Freestyle skier Emily Cook is going to her third Olympics after landing a spot on the U.S. team on Tuesday. The 34-year-old aerialist finished 19th at the 2010 Games and 11th in 2006. She also was nominated to the 2002 team but missed because of an injury. She was given a spot on this year’s freestyle team after the U.S. Ski and Snowboard Association went through dozens of calculations and possibilities. "I am so excited to be representing Team USA at my third Olympic games in Sochi," Cook told The Associated Press. "It has been a long road since my first team nomination in 2002 and I am incredibly thankful to everyone who helped me navigate the ups and downs of this journey." Several spots are awarded based on how athletes finish in qualifying events. A few are held out for those who don’t qualify based on their results but are still considered potential medalists based on their history and current performances. Cook got one of the discretionary picks, in part because she has finished in the top 10 and been the top American finisher in the last four World Cup events. "To have Emily in the Olympic Games as a three-time Olympian gives the whole program great leadership," said USSA freestyle director Todd Schirman. "When Emily nails her jumps, they’re the best jumps on the hill." Also on the aerials team is Ashley Caldwell, who finished 10th at the 2010 Games. She’s one of five women in the world, Schirman said, who try triple-flipping jumps. Cook and Caldwell are the only two women among the world’s top 12 who aren’t from either Australia or China. "We know Ashley has the jumps to compete with the Chinese, as well as Emily," Schirman said. Another discretionary spot on the freestyle team went to halfpipe skier Torin Yater-Wallace, who broke his ribs while training for the first qualifying event and hasn’t skied competitively since. Wallace is a three-time X Games medalist and is expected to be healthy for Sochi. Also added to the team Tuesday were Annalisa Drew (halfpipe), Joss Christensen (men’s slopestyle), Julia Krass and 15-year-old Maggie Voisin (women’s slopestyle). John Teller earned a skicross spot by winning a World Cup event last week. Simon Dumont, one of the most decorated veterans on the halfpipe, was left off the team. He hurt his knee during practice for a qualifying event last Friday. Left off the aerials team was two-time national champion Dylan Ferguson, who was the top American in the World Cup points standings. Mac Bohonnon is going, in part because of his second-place finish in a World Cup event, which was higher than any of Ferguson’s finishes. Ferguson qualified for the 2010 Olympics but didn’t compete because he got appendicitis. "Pretty surreal day," Ferguson posted on his Facebook account. "I don’t know what the future holds for me and my skiing career, but I appreciate all of the support."